The office of Institutional Research and Assessment introduces LAU staff and administrators to the concept of assessment. IRA acts as the central database of LAU. Click on photo above for larger version. LAU’s office of Institutional Research and Assessment (IRA) conducted a half-day workshop on July 19 to introduce 36 of the university’s staff and administrators to the concept of assessment. The workshop familiarized attendees with the major functions of the office and presented an in-depth discussion of the assessment process. “The workshop was organized as one of many actions that will be undertaken to help the university realize an important goal in its current five-year strategic plan which is to strengthen and establish an assessment culture throughout the university,” says Dr. Diane I. Nauffal, director and founder of IRA. “Now that most LAU’s professional programs are accredited or are acquiring accreditation and all our academic programs are being reviewed continuously, it is time for our administrative and support units to be assessed in a systematic manner as well,” she adds. IRA acts as the central database of LAU. It collects, analyzes, warehouses, and disseminates data about the continuum of functions of the institution – educational, administrative and support. The office ensures the integrity and consistency of information for official reporting using the definitions the university has established as standard policy. Additionally, it provides support for the institution’s decision-makers in planning, policy formulation, assessment and institutional effectiveness initiatives. The primary goals of the workshop were to introduce attendees to IRA and to the world of evidence-based decision-making and assessment for continuous improvement and to also inspire participants to re-define their goals and establish processes for measuring success. “The next step is for the participants to return to their respective departments and familiarize their own team with the ideas presented in the workshop,” says Nauffal, a member of the Association of Institution Research (AIR) in the US and the affiliate Middle East and North Africa Association for Institutional Research. Indeed, self-evaluation is a trend among top universities and consists of establishing expectations and standards to measure quality and then systematically gathering evidence to determine how well performance matches those expectations. Using the resulting information to improve performance, the goal is that administrative organs on both campuses will engage in a vigorous process of self-assessment and will recognize strengths and also diagnose areas that may require improvement. Consequently this will increase efficiency and productivity in all areas. “The workshop was indeed very interesting—it informed us about the role and function of IRA and the assessment process in a very clear and understandable manner,” says Nelly Abboud, executive administrative assistant for the School of Arts and Sciences at LAU Byblos. “Now we know that if we need any information regarding the university we will be receiving the most accurate and up-to-date information,” Abboud continues. 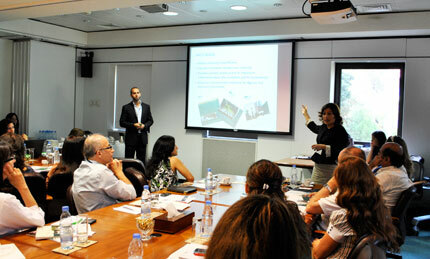 “Such a workshop demonstrates the university’s commitment to excellence,” says Firas Samko, information officer at IRA. Further introductory workshops are scheduled in the fall.